Possibly the best new thing in Blackboard Learn is the Video Everywhere tool and leverages Youtube so that students can post video in your Blackboard courses. In days of yore, recorded video for students inside a Blackboard course was like searching for that ever elusive Bigfoot in the Adirondacks. Seldom seen and only in the hard to reach (hard to teach) places. Students were relegated to using third party tools and hoping that the embed code they would use worked within the rusty environs of the old text editor. Now students and faculty can easily present, share and communicate inside blackboard via the Video Everywhere tool. First let me show you a great over view from Blackboard’s own “Quick-Hit” master; Vivek Ramgopal. His videos are a must use resource for faculty and students. Now we will look at the steps you need to take to record and/or upload a video using the Video Everywhere Tool. 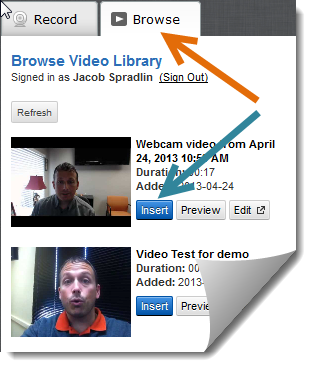 To access the Video Everywhere feature just click the little webcam button on your content editor. Video Everywhere is available anywhere you use a content editor. You can add video to discussions, blogs, tests/quizzes, wikis, journals and feedback conversations with your instructor via the gradebook. If nothing happens, be sure you have allowed popups. You will need to sign in to leverage your YouTube account to add video to your course. 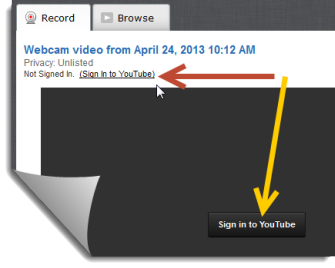 Signing in is as easy as using the Sign in To YouTube link or button. In most cases this is your Google account, so if you have Gmail or use Google Docs you are already in luck! If you do not have an account you will be prompted to create one. *Note: If you sign in and notice that you don’t have the ability to press the Record button to capture your image you will need to close your WebCam Recorder window and click the Video Everywhere button again on your content editor and then select Record. Before you record yourself, be sure that you have your webcam/microphone plugged into your computer (if needed). 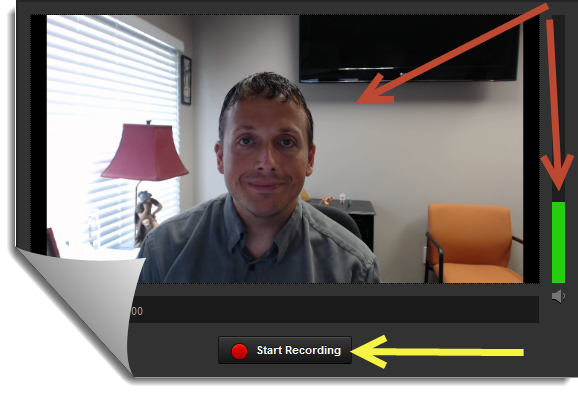 Under the Record tab in your Webcam Recorder window click the Record from webcam button. 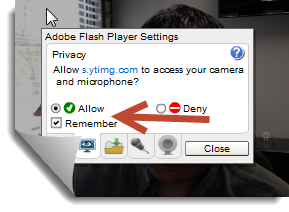 Next, you may be prompted to allow Flash to use your Webcam if so, select the Allow & Remember checkboxes, then click Close button. You are almost ready to start! Be sure that your webcam and mic are working by checking to see if you see yourself and when you talk if the green bar appears on the right. When you are ready, click Start Recording to begin. Your Video will begin recording. When you are ready to stop, click the Stop Recording button. If you are satisfied with the recording, click Upload otherwise click Start Over and try again. Next choose whether you would like to embed your video by choosing Play in Place or use Thumbnail to open a separate window to play your video. *Best Practice Alert: Choosing thumbnail will allow thoses people who come in on mobile devices an easier way to view the video. Click Insert to place your video. Once you are ready to to complete your assignment, discussion, blog, wiki or conversation press Submit! You can also add previously recorded YouTube videos from your Video Library! Click the Video Everywhere button on content editor and sign in if you haven’t already. Click the Browse tab to access your Video Libary and click the Insert button next to the video you’d like to add to your post. Once you are ready to to complete your assignment, discussion, blog, wiki, journal etc., click Submit. 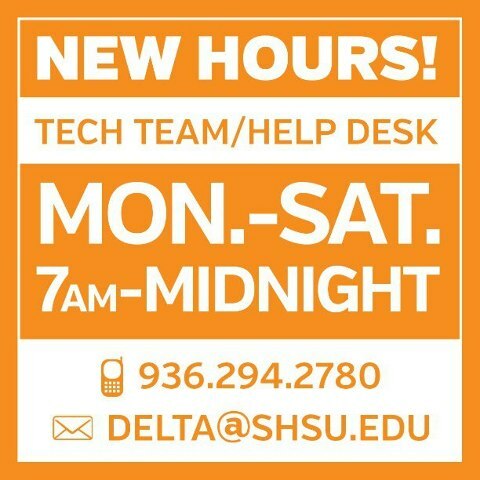 SHSU Online Tech Team has new Help Desk Hours! Yes, that’s right, now you can receive help from 7am – midnight Monday – Saturday* by contacting our Technical Team at the SHSU Online Help Desk. Our team has added a full-time staff member to expand when we can assist you. We now have three full-time staff members and 5 student assistants to serve you! *Note: We are Currently closed on Sundays and will also close for school holidays. Do you ever wonder what a student feels like when they first visit a Blackboard course? Are they overwhelmed? Do they know what to do, where to go or who to ask for help? 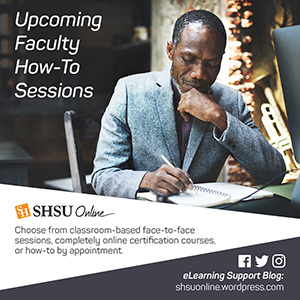 That is why SHSU Online has put together the Getting Started: Blackboard Student Orientation course for all SHSU students. We have included it as a link in all Online courses for the Summer. Students can also get there by clicking the Getting Started Tab at the top of the Blackboard window in their Internet browser. One of the resources we make available in the Getting Started course is an icon legend that allows them to know what types of items are commonly used in courses and what they are. Below, you will see the Icon Legend we have available under the Where do I go From Here? section under the Course Environment learning module. Embedded content (text or image) that is displayed on the page on which it is created. A folder to organize several content items. Click on Folder title to access content within. A link to a Discussion Board. Links can be made to the entire discussion board, which includes all the forums. Or a link can be made to a specific forum of the Discussion Board. A link to a Bb assignment. An assignment is something that students submit on Blackboard. 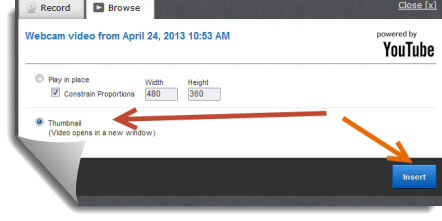 It gives students a submission textbox, file attachment options, and a Submit button. A link to a deployed test (one which students have access to) in Bb. A link to an external website (outside of Blackboard). A link to something else in the course. The icon that gets displayed depends on what the courselink links to, but it will always display a small chainlink in the icon. A collection of content that can be displayed sequentially with a table of contents. A collection of information linking objectives, activities, and resources. A link to a Group page from which students can access the tools that the instructor has made available to their group. A link to a deployed survey (one which students have access to) in Bb.